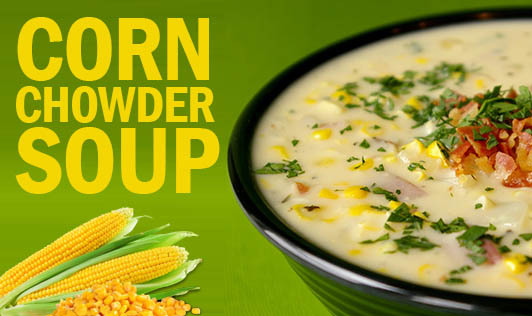 Made from corn, celery, assorted and creamy white base, this classic English soup will definitely keep you warm this monsoon! • Take 4 cups of water in a deep pan, add all the vegetables, and boil till it reduces to ¾ of its quantity. Keep aside to cool. • Blend the mixture in a blender until smooth, strain it, and keep aside. You can use it as and when required. • Heat the butter in a nonstick pan, add onions and celery and stir on a medium flame till the onions turn translucent. • Add the maida and cook on low flame for 30 seconds, while stiring continuously. • Add the white base stock, milk, and simmer for 5 to 10 minutes, while stirring continuously. • Add the sweet corn kernels, salt, pepper and nutmeg powder, stir well and simmer for another 10 minutes. • Garnish with celery, tomatoes, and cheese and serve hot.